When you think of a speaker, you think of JBL. It is such an amazing brand for speakers and so many great sounding series of speakers have been introduced by the brand. The JBL Charge 3 has looks similar to JBL Charge 2+ with somewhat the same price. JBL charge series speakers are loud and perfect for party hoppers. JBL charge 3 speaker has a pounding bass that enhances the audio quality giving you a great music experience. The best part about the speaker is its waterproof. You can use the speaker for your pool parties or picnics to enjoy its full functionality. The size to sound ratio of the speaker is good so you can expect a great audio output. The speaker is not that great for audiophiles but that will surely not bother you. As the audio is loud and clear, you will enjoy every beat with great zeal. JBL Charge 3 speaker charges to other devices so you do not have to worry about charging as well. The sound is astounding and perfect for parties. It’s also portable so you can carry it anywhere you like. If you compare the speaker with its previous version, then the features have been updated and you won’t be disappointed with the purchase as well. It’s a perfect compact speaker to enjoy music on the go. JBL Charge 3 speaker is for casual listening. As the speaker is durable and sturdy, you can use it anywhere. It’s perfect for outdoors and party with your friends. The design and grip of the speaker are good so you will not have any problem placing it. If you like JBL as a brand for speakers, then this one should be on your list for sure. A great feature of the speaker is its connectivity. The Bluetooth connectivity is so good that you can enjoy continuous music without any disturbance or interference. The powerful stereo sound performance is another highlight of this good sounding speaker. The speaker integrates with the app so that is again a great feature. You can synchronize the app with the speaker and control all your options with the touch of a button. The equalizer settings in the app also let you set your tone for music in a perfect way. The pairing of the device is also good; you can actually pair the speaker with various options at a time to enjoy your music loud and clear. It’s perfect for those cozy house parties; you will love the sound of the speaker for sure. There are many great features of the JBL Charge 3 speaker, let us look at some of them. JBL Charge 3 speaker has amazing wireless Bluetooth streaming. It wirelessly connects up to three smartphones or tablets to give amazing sound every time you hear your music. The speaker has 6000 mAh power bank so you can hear your music without any trouble. Up to 20 hours of playback time can give you a great audio performance every time. You can charge the speaker with a tablet or phone via USB. With one touch of a button, you can take clear calls from the speaker. The speaker also features echo canceling that lets you speak clearly in a noisy environment too. It features IPX7 waterproof technology that keeps your speaker dry. Whether its rain or stain, there won’t be an issue with the speaker. JBL Charge 3 speaker comes with amazing voice assistant integration. You can directly access Google now or Siri with the help of this feature. With a button, you can access your music on the go. The speaker also features JBL connect. It lets you build a unique base where you can connect other JBL enabled speakers to greatly amplify your listening experience. JBL Charge 3 speaker is durable and the build quality is just perfect. Its made of great rugged fabric that is perfect for all your outdoor adventures and parties. You can play it along anywhere you like. The speaker has a special bass radiator. You can feel the bass with dual bass radiators that will give you great audio performance and sound. In fact, the bass base of this speaker is simply amazing. The speaker has a Battery type: Lithium-ion Polymer (22.2Wh) that gives a great experience. The batteries are included with the speaker. The speaker is light in weight being sturdy so you can carry it along with you. 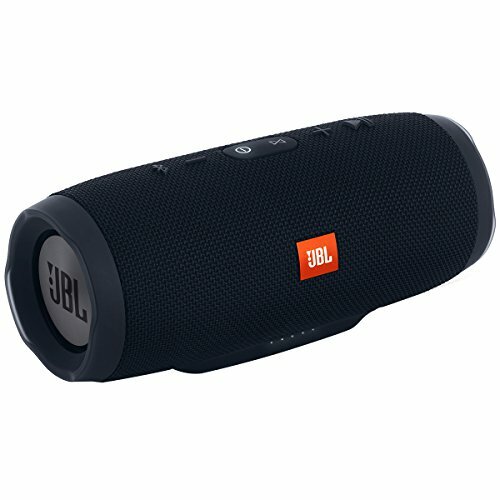 The sound quality is crisp and perfect in the bass making it the most popular speaker by JBL. The overall music streaming of the speaker base is great. You can stream your music by integrating it with music apps in the IOS and Android stores. JBL charge 3 speaker is a big speaker so design wise it’s amazing. But, it’s not so ideal for your small sling bags. Design wise JBL Charge 3 and JBL Flip 4 enjoy pretty stunner looks though Charge 3 is bit larger than Flip 4. You can carry the speaker in your backpack if you need the speaker for your outdoor music. The best feature of the speaker is that it’s waterproof. So, even if you submerge the speaker in water for thirty minutes, it won’t affect the audio in any way. The buttons are on the front side so you can access the speaker with one touch. The pause, play and connect button can make your task easier. The rubber guard around the speaker protects the speaker so that you can hear the sound clear. The sound quality of the JBL charge 3 speaker is amazing. The low and mid frequency range is quite powerful if you compare it with other speakerphones in a similar range. The speaker is loud but it does not suffer a bit in high frequency. The audio is clear and does not really crack up. The high-frequency playback is the highlight of this speaker. The exposed woofers add to the beauty of this speaker. When you play the speaker loud at a party or outdoors, there is no distortion and this is where it scores the highest. Overall performance is good for the price it offers. The set up of JBL charge 3 speaker is easy and the controls can be accessed in one touch. There are control options on the top with the JBL logo on the speaker. There are no added controls in the speaker but you can integrate it with the apps. You can easily set this speaker with voice integration. It plays along with Google now and Siri both. So, you can manage your music with voice control too. The software is also on par and there is no issue in integration. You can also stream the music with various other devices and apps. If you compare it with other speakers, the set up is simple. JBL charge 3 speaker is the best speaker in sound performance. It can project a sound at a great distance and therefore it’s ideal for your parties. The bass base of the speaker is not only powerful but also amazing. Even if you play your song at the loudest volume, there will not be any kind of distortion in the performance of this speaker. It will easily resonate with the sound to give you an amazing music experience every time. It’s compatible with almost all the JBL devices. In fact, it’s also compatible with Apple devices. You can also use different apps with this speaker for listening to music. The connectivity of the speaker is great and there are no hiccups. You can connect to Bluetooth and listen to music for hours. But JBL Charge 2+ speakers surely enjoyed more fan following owing to its battery life, the build quality and of course the sound. As the speaker is loud and clear, you can also enjoy the music on the go. Its connectivity is also good with different devices. JBL charge 3 speaker has a great battery performance; in fact, it scores high in this department. On a single charge, you can enjoy up to 22 hours of playback time. But, this also depends on the volume level. If you play the music loudly, then the battery can drain quickly. This also depends on the way you use the speaker. It suffers in the mid-range. JBL Charge 3 speaker is a good speaker with amazing sound performance. If you compare it with the previous speaker, then the features are much better. JBL Charge 3 does have that cylindrical design but Ultimate Ears Boom 2 has slightly more minimalistic and simple design. The waterproof feature of this speaker makes it a must buy. You can enjoy nonstop music outdoors with this feature. It indeed has convincing features with a great battery life.